Of all the plant spirits I’ve worked with in the past five years, oregon grape (berberis aquifolium or mahonia aquifolium) has been richly rewarding. It’s a common low-lying dweller in the undergrowth of northwestern forests, preferring shady areas, and having a distinctive leaf similar in shape to the holly tree. It also has clumps of little purplish-blue berries starting mid summer which are the source of its modern common name, though these berries are not grapes in the true taxonomic sense. Oregon grape has been gaining a lot of attention recently due to the scientific discovery of its ability to reduce anti-biotic resistance across the board. Preliminary studies show that it’s able to do this by reducing bacteria’s ability to excrete pharmaceuticals from their cell walls, though the exact mechanism remains a mystery. This research, however, is only touching the tip of the iceberg of what traditional herbalists have known for a long time: oregon grape regulates our internal ecology through the synergy of its many constituents, the most famous being berberine. It’s interesting to note that in the pharmaceutical studies on anti-biotic resistance, berberine alone was not able to achieve the same results as the whole plant extract, which gives further credence to the concept of plant synergy, or that a plant medicine is more than just the sum of its parts. Each component works together with all others to make it a medicine, and not the idea of “key constituents” or isolates. The term “herbal anti-biotic” gets thrown around a lot but it’s not exactly comparable to something like penicillin. The reason is that plants from the berberine family, like barberry as well as the famous (and now endangered) goldenseal, don’t kill off all micro-organisms wholesale. They modulate organism environments, keeping certain species in check while promoting the proliferation of others. In a forest, what humans would call “infection” is merely the excessive growth of one bacterial species over others, causing imbalance. 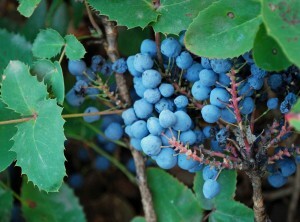 Certain plants, such as oregon grape, keep populations at appropriate numbers so that none becomes an excessive problem. Oregon grape has the ability to do this within our own bodies at smaller doses. If there’s bacteria that are not native to our healthy internal ecosystem, or there are numbers of certain bacteria overgrowing, it will modulate them. Compare this to penicillin, which will kill all bacteria, friendly or not. The root bark of oregon grape is where we find the highest concentrations of medicine, and it’s been noted by ethnobotanists like Elliot Cowan that the bark is teeming with bacteria that don’t seem affected by the high levels of berberine within the plant; and yet, those same bacteria would be swiftly dispatched within our bodies if we take oregon grape as a remedy. Somehow this plant spirit synergizes with immune systems, knowing what belongs where, and in what numbers. It’s this function that continues to be a marvel in the world of herbalism! When you treat any kind of infection with oregon grape, you are reinforcing the body’s native balance, not “fighting the infection”. Anything that restores balance restores health. This is why oregon grape receives the herbal label of alterative. It gradually alters the body over time to bring it back into better health, with more permanent results. Yellow medicine to the rescue! The medicine of this plant is yellow and its nature is cold. This gives us a hint into what it does. 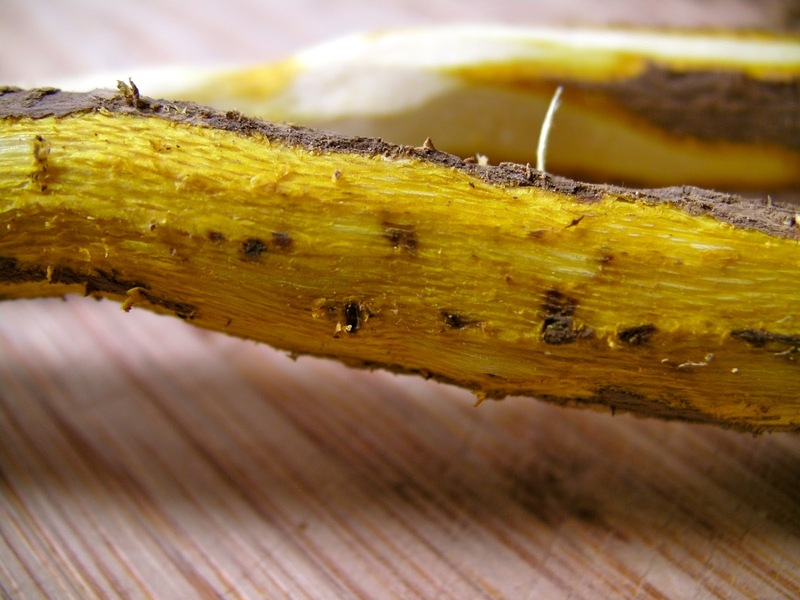 Yellow in Traditional Chinese Medicine relates to spleen and stomach, the digestive system. Yellow is also the colour of dampness and heat combined, which is the colour of what is released by the body during specific kinds of infections. Its drying and cold natures do mean that it’s more suitable to bodies that tend to have excessive mucous and phlegm, or watery conditions, especially in the digestive tract and lungs. It also means that it’s better at treating fiery infections, or heat related conditions, at higher doses. That said, west coast herbalist Michael Moore has been promoting another use of oregon grape in recent years, through its tonic action. Tonics gently strengthen the body over time, usually by promoting the metabolic action of one or more internal organs. Some tonics have a whole-body effect, like the ginseng family. Oregon grape on the other hand, in smaller doses, has a tonic effect on the liver and over all digestive health. (In larger doses it acts as a remedy for acute bacterial infections). The tonic doses are well indicated for people who have “cold livers”, as it’s put. If you have a “cold liver”, it means your liver is sluggish. People with this condition tend to do well with carbohydrates and foods that are easily but rapidly processed. Foods that are dense or high in protein won’t go over well and cause a feeling of heaviness. To these people, the idea of eating a cold salad is irksome. They also tend to have poor appetite in general. Oregon grape helps such individuals to reinvigorate their digestive fire, as well as to train the body to accept denser or cooler nature foods again over time. Paradoxically, higher doses of oregon grape are good for fiery infections, and yet at lower doses it helps to stoke the heat of digestion. Very dualistic! I’ve noticed in my practice that individuals with this constitution grew up in conditions where food was more scarce, or where food was abundant but it was all refined (processed food, sugars, starches). As a result, their digestion tends to be more delicate and doesn’t like to expend a lot of energy breaking down cold or dense food. Oregon grape teaches the body how to accept these foods into the constitution again over the long-term, through its alterative action. It’s also a wonderful restorative for those who have had chronic illnesses or recent acute illnesses that knocked out their digestion and their appetite just hasn’t been strong enough since. Because it’s a cholagogue, oregon grape is a great blood purifier. The promotion of bile excretion means that any built up wastes in the liver can be eliminated more efficiently, which also promotes bowel movements in those with constipation. That makes it a great potential remedy for those with skin conditions such as eczema and psoriasis, which are conditions spurred by the presence of pathogens or allergens in the blood that make it to the skin and cause immune reactions. In a nutshell, you can sum up oregon grape as: digestive tonic and invigorator of slow digestive systems, blood purifier and clarifying agent, and modulator of flora. So many wonderful uses! I’ve found that through my own experiments with oregon grape in the past few years that its spirit medicine tends to relate to clarity and one’s ability to digest life on life’s terms. In other words, acceptance. This looks a bit different than grief, which is difficulty accepting loss. The kind of acceptance that oregon grape helps us with is our ability to accept what is presented to us in any given moment, metabolize it, understand what it means to us, and then make appropriate decisions. It is an herb that brings us back to centre through teaching us to stop arguing with reality or resisting the nature of what is, by clarifying internal blocks that obfuscate perception. If you tend to get contractions in your gut whenever you have a hard time stomaching a situation or making a major decision, and if those contractions tend to lead to disturbances to your digestion (loss of appetite, constipation or diarrhea, only being able to eat lightly or easy to digest foods), then this plant spirit may be a helpful ally. It should be used long term for this effect and at much smaller doses than what you would use to treat an infection. For more information on which use may be appropriate to you, and the necessary dose, be sure to consult someone with a lot of herbal experience who can do a proper workup on what you need. All in all, oregon grape is a very powerful ally to have on hand and is one that deserves a great deal of respect.